(Sheep and Lambs - Persian Lamb Fur-03) This man is chasing down a new born Karakul lamb to kill him or her for his or her skin. It is easy to see how frightened the sheep are. They know they will never see this lamb again. 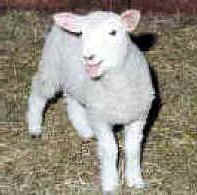 Because these lambs are so small, many of them will be killed and skinned to make one fur coat.